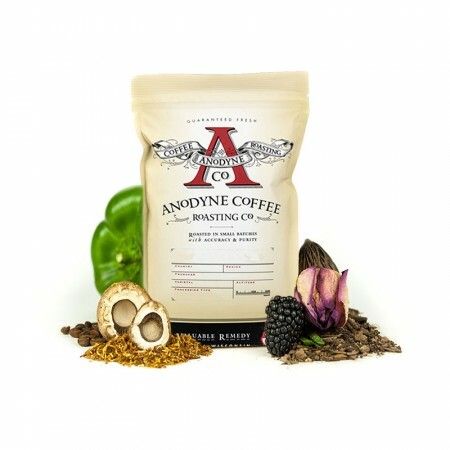 This is the Dark Roast Sumatra Takengon Ketiara brought to you by Anodyne Coffee Roasting Co. This is a Fair Trade and Organic certiified coffee that was grown by the Ketiara Coop in the Aceh region of Sumatra between 1,200 - 1,600 meters above sea level. Enjoy the intense, full bodied cup with smoky, earthy and nutty notes. Pretty good, but I think I prefer even darker roasts. So this coffee was a little lighter than I would normally like. I am drinking it right now, and I do get the earthy / nutty notes, but the smoke is quite light. For me it lingers on my palate with just a touch too much acid that I would associate with a lighter roast. As for the beans themselves, there wasn't really any oil on them so I think they weren't roasted as long as some of the darker coffees I enjoy and the overall appearance was more walnut brown then a dark cherry wood brown in tone. Over it was a good coffee, but not one I think I would go out of my way to seek out. This coffee was delicious. I loved the earthiness and full bodiedness. I think I could do without the smoky aspect but everything else about it was great! full flavor with a hint of caramel and rich apricot undertones...Love it! Makes a nice cup of coffee. Not too powerful flavoring. This coffee tasted burnt and acidic. I liked the previous blend better. Interestingly complex, but more acidic and a lighter bean than I typically enjoy. Just a touch less pleasing than the Metro, but not enough to drop a star. Would of been 5 stars, but the flavor wasn't that deep / rich. I like it but I wish it was a darker roast. The beans should be dark and oily. The full body provided some complexity that yielded earthiness initially, and then finished with a really nice lingering nutty note. Maybe a little too much smoke/earth. It would be great to have some other varying notes while maintaining the full body. Not particularly intense nor that flavorful. I appreciate its wonderful pedigree, but it doesn't measure up to other Sumatras I've had. I don't understand why I have not received a product better than what I can buy in the grocery store under the StarBuck's label. I usually buy French Roast and will continue after your next shipment, if you don't send me something better. So far, these have not exceeded my expectations...The brewed product is not full bodied, nor aromatic ... I love the aroma when grinding which results in a fine grind, but when brewed, the results seem weak..Is it something I'm doing? I bought a Brawn grinder and a new Cusinart coffee machine? I just opened this. It is pleasant and somewhat milder than I thought it would be (and the beans are somewhat lighter than I would have predicted). As I drank it, I found myself enjoying it more, especially appreciating the body. very good, would prefer a little fuller flavored coffee.